Petflation Update: 2015 – 1st Quarter – March saves the day! When we took a look at 2014 Pet Industry Sales in a recent post, we found a lot of overall positives – 83.1% of the growth was real and inflation was only 0.68%, the second lowest in history. However, when we looked a little closer, we found these “positive” numbers came from combining 2 potentially negative situations. The service side of the business, especially Veterinary had a continuing high inflation rate which has limited growth in the actual amount of services sold over the last 5 years. While Supplies and now Food were showing deflation – usually a sign of commoditization and not a healthy situation for any segment. 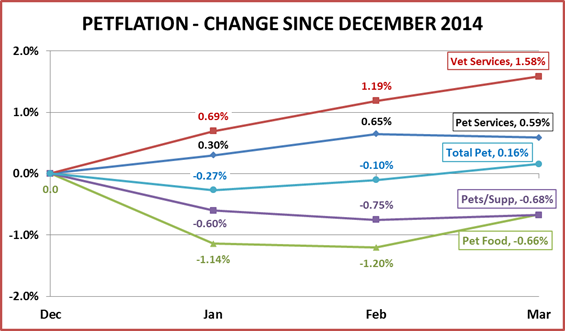 December brought a surprise price increase in both Food and Supplies. Let’s take a look at what has happened since. The “normal” December drop in Food and Supplies got pushed to January this year. The January drop of 1.1% in Food was the largest monthly price drop in this segment in 17 years and the second biggest drop in history. Veterinary prices accelerate their increase. 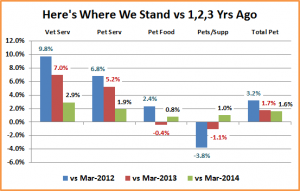 The Total Pet Market Prices went positive in March due largely to increases in Food and Veterinary Services. Let’s take a look at the monthly history over the last 18 months to get a better feel for the rollercoaster ride in Food and Supplies. March of 2015 and March of 2014 are outlined so you can see the journey over the last 12 months. 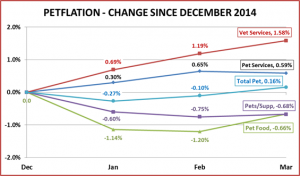 March of 2014 was the pricing “low point” for the industry in 2014. We are about 1.6% above that level this March. All segments are above the pricing of a year ago. There is also a little encouragement in the Food and Supplies segments. While the monthly pattern doesn’t exactly match a year ago and some monthly drops have been precipitous, the duration of the declines appears to be shorter. Veterinary Services – One has to wonder when this segment will at least slow down in price increases. 2011 and 2012 showed actual decreases in the amount of Veterinary Services sold and the annual adjusted growth rate since 2010 has slowed to 0.9%. Yet the price increase from December to March this year actually exceeded last year. The continuing high prices increases in the Veterinary segment does seem to be having a positive impact – building the OTC Meds/Supplements category in the Supply segment. NonVet Services – The price increases in this segment have been more moderate – in the range of 2-2.5% annually. So far this has not negatively impacted consumer purchases as the segment continues strong growth. In fact, it has become a big plus for the Pet Store Retail Channel. 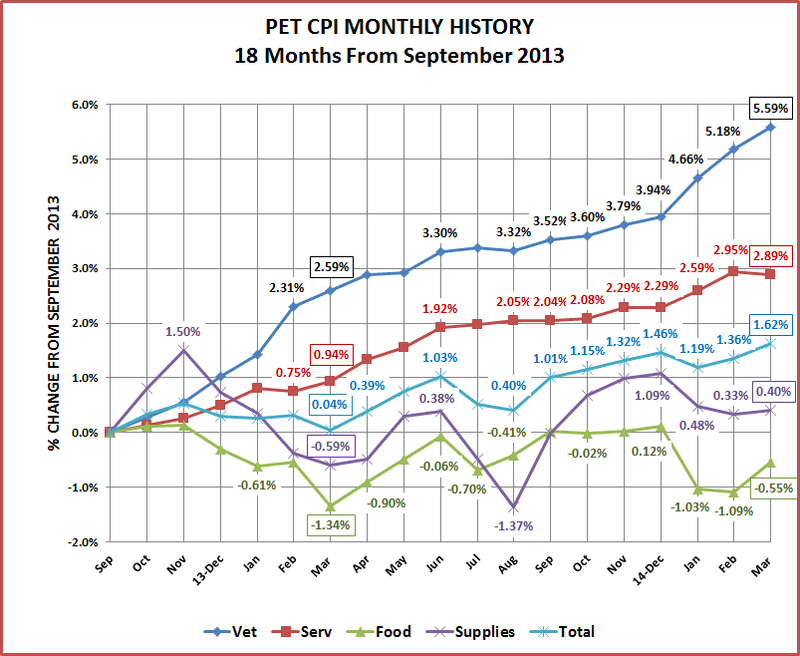 Pets and Pet Supplies – Prices are actually above the same period a year ago. However, before we celebrate too much, we should remember that they are still 3.9% below what they were in March 2009 – 6 years ago. The deflation in this segment is an ongoing issue, with no easy fix. It has not been a precipitous drop like what occurred in the Human Toy market years ago. However, with more and more categories becoming commoditized the decline is very real. Since the recession, U.S. consumers have become more value driven than ever before. We need to “make it better” if we expect them to pay more – Innovation! Pet Food – This largest segment is perhaps the biggest concern. The huge price drop in January – the largest in 17 years – is a pretty good wakeup call. 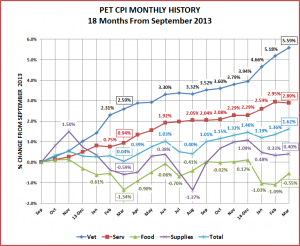 However, retail pet food prices in the last 18 months have largely been below the level of September 2013. Remember, the CPI numbers from the U.S. Government include both food and treats so deflation caused by commoditization is a bit more complex than if it were food alone. 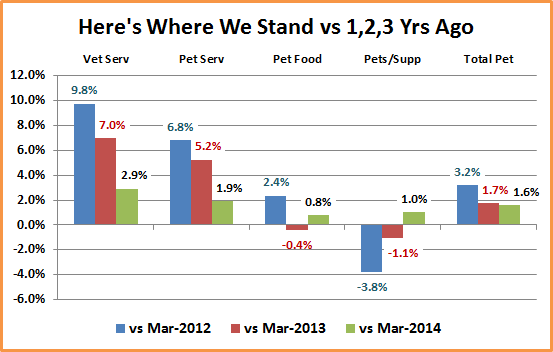 Total Pet Market – Services Way Up – Food & Supplies Down. As we have said, put these 2 negative situations together and they give a somewhat “false positive” read for the overall market. We need moderation in the increases and innovation in the deflationary segments to turn them around. 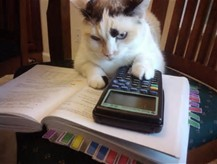 It’s a little early to guess the overall Petflation rate for 2015. However, if the current situation continues, it could very well be similar to 2014 at about 0.64%. As you can see 2014 was a tough year in the industry from a pricing perspective. We’ll see what the balance of 2015 brings!